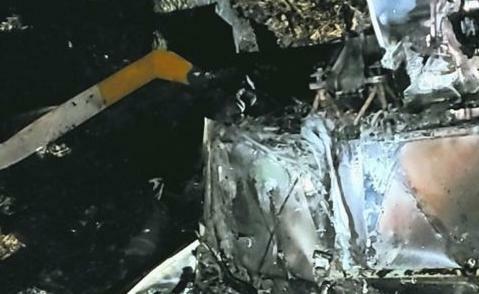 The Virginia State Police is investigating a helicopter crash Saturday night in Clover. A helicopter, piloted by Lee B. Hilty of Alton, had just taken off from a private, grass airstrip shortly after 10 p.m. Saturday but failed to “gain enough altitude and struck some nearby treetops,” according to a state police news release. The Robinson R22 Beta then crashed to the ground and caught fire, police reported. Hilty was transported to a nearby hospital for treatment of serious injuries. Clover Volunteer Fire Department Chief Jamie Davis said the fire department received a call for the crash on Mill Road at 10:06 p.m. on Saturday. The helicopter was declared a total loss, according to Davis, who said Clover Volunteer Fire Department responded to the crash with 13 firefighters and Triangle Volunteer Fire Department responded with seven firefighters. Triangle Volunteer Fire Department Chief Jeffrey Francisco said the crash occurred when the helicopter pilot was taking off from a private airstrip located at 2042 Mill Road. Francisco added the helicopter caught fire after crashing, with the pilot managing to escape the cockpit. HALIFAX COUNTY, Virginia (WDBJ7) -- Virginia State Police are investigating after a pilot crashed a helicopter Saturday in Clover, Virginia. Police say the pilot, later identified as Lee B. Hitly, of Alton, Virginia., was able to get out of the helicopter safely after it caught on fire. He was taken to the hospital for treatment of serious injuries. The Robinson R22 Beta had just taken off from a private, grass airstrip around 10:08 p.m. but failed to gain enough altitude and struck some nearby treetops. The helicopter then crashed to the ground and caught fire.